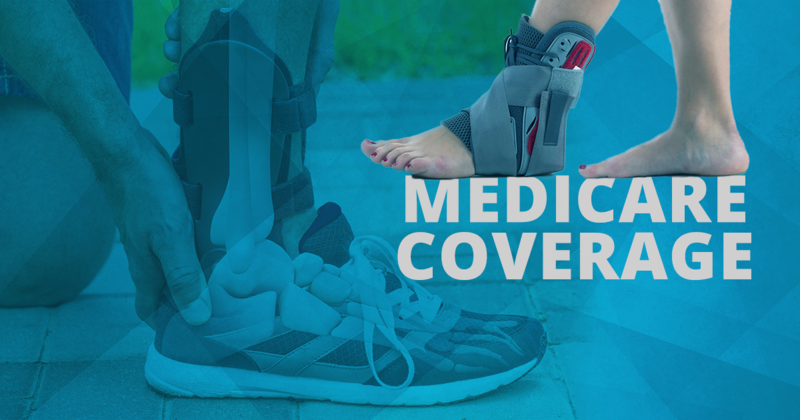 If you’ve suffered a foot or ankle injury and need a brace (or orthotic), Medicare may cover it. This applies for both custom-fitted foot and ankle braces as well as off-the-shelf models. As long as your doctor deems it medically necessary and you buy the brace from a Medicare-approved supplier, Medicare will probably cover it. In order to qualify for a covered foot or ankle brace, you must undergo a physical exam with your doctor in a face-to-face consultation. Part B may also cover therapeutic shoes and inserts for people with diabetes who suffer from neuropathy and diabetic foot disease. Medicare does not cover foot and ankle braces used for comfort or preventative purposes. Medicare is also unlikely to pay for any luxury add-ons like warming braces, circulation support, and additional comfort features. Medicare Part B covers foot and ankle braces as durable medical equipment (DME), which is medical equipment that may be used for multiple uses, up to several years. After you’ve met the Part B deductible ($185 in 2019), Medicare will pay for 80 percent of the brace and you will be responsible for the remaining 20 percent. Unfortunately, there are scams going around that claim Medicare will give you free orthotic braces. This is not true. Beware of anyone calling you about free braces, and never give your Medicare or personal information to anyone with such an offer. These widespread scams take thousands of dollars from Medicare for products that are cheap and not well made. If you need a foot or ankle brace, contact your doctor.